When the Series 1A sports car was discontinued in December 1966, it was succeeded, a month later, by the Sunbeam Tiger Series 2 sports car. The main feature of this model was that of the engine, which was a bored out version of the 260 cubic inch with a longer stroke. The modified engine, whose capacity was now 289 cubic inches (4.7 litre), developed 200 bhp at 4400 rpm. In essence, apart from the larger engine, redesigned grille, and the speed stripes, the Series 2 sports car was very similar to the Series 1A. The new model, unavailable in the UK, was marketed specifically for export to the US, where it was designated the Tiger 2. By this time, Chrysler had taken over control of Rootes Group, and the badge displaying "Powered by Ford 260" was replaced by one saying "Sunbeam V8". Featuring the 289 cubic inch engine, and being produced in such small numbers, the Series 2 was probably regarded as the most desirable. The Series 2 sports car was phased out in June 1967 after only 536 units had been built. This meant that a total of 7,085 Sunbeam Tigers, covering Series 1, 1A, and 2, were produced in nearly three years. During the 1970's, many inexpensive, second hand Alpines were available, which allowed individuals and others to convert them into Sunbeam Tigers. The problem, at that time, was how to recognise these conversions. The solution was the International Registry of Sunbeam Tigers which held data on each genuine Tiger, such as engine/chassis number and current ownership, where known. 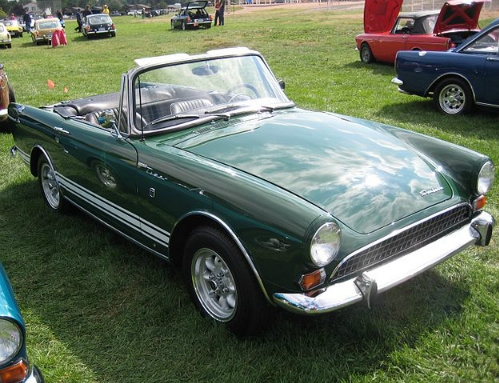 Furthermore, the Sunbeam Tiger Owners Association used a unique method in which the body shell was studied in order to identify assembly techniques specific to a Tiger. The result was that once a car had been verified as being an original Tiger, a non removable, permanent registration tag was attached to an unobtrusive body panel. By 1964, the financial position at Rootes Group was becoming very serious. At the same time, Chrysler was looking to strengthen its position in Europe and so, in June 1964, it acquired a non controlling stake in Rootes. By 1967, they were allowed, by the UK Government, to take a full controlling interest. One of the engines that Rootes Group considered for the Tiger was the 3.5 litre, aluminium, V8 unit owned by General Motors. However, this option was removed when Rover acquired the engine. Following the takeover, Chrysler's plan was to install their own 273 cubic inch V8 engine into the Sunbeam Tiger, since it had already been used in the Dart and Barracuda saloons. Realising that it would cost too much to modify the engine bay of the Tiger to accept their 273 cubic inch V8, Chrysler decided to phase out the Tiger once the current stock of Ford V8 engines had been exhausted. In the meantime, Chrysler added their own logo to the car's existing badges, and removed all reference to Ford in their Sales literature. Consequently, the last Sunbeam Tiger Series 3 sports car was assembled by Jensen on 27th June 1967. 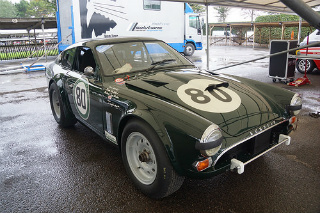 In 1964, three highly modified, production Tigers were fitted with fastback bodies built by LIster Cars, who were renowned for the Lister Jaguar, and entered in the Le Mans 24 hour race, where they were timed at over 160 mph. Based on the Alpine Series 4, Carroll Shelby was asked to build a stateside racing Tiger, which duly won the 1964 SCCA (Sports Car Club of America) Class B Pacific Coast Championship at Willow Springs, where it beat Jaguars, Stingrays, and Cobras. Later, the car was reassigned to the Hollywood Sports Car dealership. In 1965, its first race with them was the Santa Barbara Road Race, in which it gained a Class B win. Later that year, it finished third in the SCCA Pacific Coast Division. It was also raced on drag strips, and for two years, held the National Title of the American Hot Rod Association. It was entered in European Rallies, and took the first three positions in the 1964 Geneva Rally. In the 1965 Monte Carlo rally, two Tigers were entered, and finished in 4th and 11th positions. By 1966, following the Acropolis Rally in which it came first in its class, the sports car was no longer entered in rough terrain competitions, since its low slung construction was not suited to these conditions. A 1967 Sunbeam Tiger Series 2 in good condition could fetch anything between £25,000/$40,000 and £40,000/$60,000. However, a fully restored example in showroom condition could command as much as £150,000/$250,000.